We’d love your help. Let us know what’s wrong with this preview of Karas be gėlių. 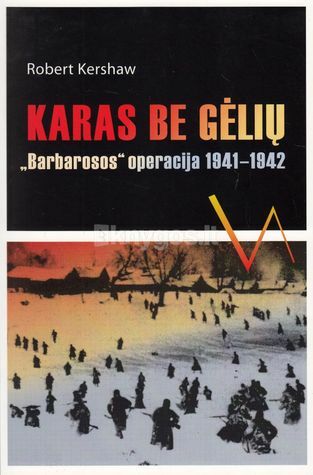 Barbarosos operacija 1941-1942 by Robert Kershaw. Remdamasis vokiečių dienoraščiais, pokariniais atsiminimais, laiškais, slaptomis SS bylomis ir kitais šaltiniais, autorius apžvelgia „Barbarosos" operaciją (1941-1942) daugiausia iš paprastų vokiečių kareivių ir jaunesniųjų karininkų perspektyvos. Išsamiai nagrinėjami ligi šiol menkai įvertinti veiksniai, nulėmę šios kampanijos baigtį. Prieš skaitytojo akis atsiveria įspūd Remdamasis vokiečių dienoraščiais, pokariniais atsiminimais, laiškais, slaptomis SS bylomis ir kitais šaltiniais, autorius apžvelgia „Barbarosos" operaciją (1941-1942) daugiausia iš paprastų vokiečių kareivių ir jaunesniųjų karininkų perspektyvos. Išsamiai nagrinėjami ligi šiol menkai įvertinti veiksniai, nulėmę šios kampanijos baigtį. Prieš skaitytojo akis atsiveria įspūdinga ir plati kampanijos panorama, nuausta iš kampanijos dalyvių asmeninių atsiminimų ir autoriaus istorinės bei profesionalios karinės analizės. To ask other readers questions about Karas be gėlių. Barbarosos operacija 1941-1942, please sign up. "War Without Garlands" derives from the German expression Kein Blumenkrieg which the German soldier described the battle on the Eastern front. From a total of 19 to 20 million German soldiers that fought in the Second World War, about 17 to 19 fought in Russia. Nobody has written a definitive 'soldier's' account of "War Without Garlands" derives from the German expression Kein Blumenkrieg which the German soldier described the battle on the Eastern front. From a total of 19 to 20 million German soldiers that fought in the Second World War, about 17 to 19 fought in Russia. The book mainly focuses on the operations of Army Group Centre, with a few side glances to the operations of Army Group North towards Leningrad, and Army Group South in the Ukraine. Kershaw does a great job: he delivers detailed accounts of German and Russian soldiers and civilians, while at the same time keeping the reader informed about the overall German strategy. His style of storytelling gives the reader a sense of intimacy with the soldiers and shows the reader what is was like to be a German or Russian soldier. Having read a lot about the Eastern Front, I found this book very refreshing. It even thought me some new facts that I didn't know of and it showed me why the German invasion was destined to fail from the start. Also a pleasant surprise were the illustrations, highlighting important German tactics, such as the Schwerpunkt doctrine and tactics for the destruction of enemy pockets. Through the letters, diaries and reports, Kershaw shows us what it was really like: the enormous losses suffered by the Germans, the failing equipment, the bitter cold and the stubborn Russian resistance. This makes this book (626 pages) very readable and an enjoying read. The book starts with some personal German reflections about the invasion in Russia. German soldiers had their doubts, but the overall German soldier believed in his superior officers and the Führer who had already demonstrated economic, diplomatic and militairy capabilities. If they had doubts about invading Russia, these were swept away by a strong belief that the Führer had it in hand and knew his business. The German invasion was more than trying to knock Great Brittain's ally out of the war: it was a race conflict between the Russians and the German Aryan race for Lebensraum. Therefore, the concept of comradeship between soldiers must be forgotten. It was a war of extermination. The Germans greatly underestimated the difficulties with fighting (and winning) a war against Russia. The lessons from the past (Charles XII's invasion in 1708 and that one of Napoleon in 1812) were studied, but potential historical similarities should be out weight by the technological advances and ideological and racial differences. While German logisticians were calculating that they could supply German forces within a zone of approximately 600 km east of the start line, strategic planners were setting goals up to 1,750 km beyond the frontier. The German planning focused on operational aspects, with less regard paid to logistic efforts required to sustain the three massive German spearheads. Hitler's primary objectives were all economical: the Ukrainian grain lands, the Donetsk basin and the ultimate prize, the Caucasian oil fields. There were no doubts. The German soldier appeared capable of doing anything and failure was out of the option. The world 'would hold its breath'. From the first moment, the German soldiers realized it would prove to be not another 'walk-over' just like in Poland and France. The attack on the citadel of Brest-Litovsk by elements of the 45rd Division is vividly written is this book. The Germans lost in the first 24 hours many men, almost two-thirds of the entire lost during the preceding six-week French campaign. The German soldier was not only surprised by the great quantity of the Russian forces, but also by its tenacity. Few Russians surrendered and most fought until the last man had fallen. The citadel of Brest-Litovsk, expected to fall within 8 hours after the invasion, only fell after a siege of 42 days. The Russian tanks were also an unpleasant surprise. Although the vast majority of Soviet tanks were obselete T-26 and BT-2s, 5s and 7s, the remainder consisted of KV-1s, KV-2s and T-34s. A single KV-1 tank was able to block the advance of the 6th Panzer Division for 48 hours. The German tank crews were clearly shocked by the appearance of heavier and obviously superior Russian tanks. The Russian tanks presented a wholly new level of armament, armor protection and weight. The German PzKpfwIIIs and PzKpfwIVs were no match for their Russian counterparts. Only their battle experience, superior tactics and the fact that the Russian air force was nowhere to be seen, helped the Panzers in winning their tank battles. The German army was making headway, but at some cost. Following along the lines of the classical Blitzkrieg doctrine, large concentrations of Russian troops were encircled by the Panzers and finished of by infantry. The experience in Poland and the West was that Blitzkrieg tactics achieved operational success once armies hat been outmaneuvered. Denied space and resources, the political will collapsed when faced with pointless casualties. However, the Russian soldier fought on in hopeless conditions. Up to 50% of German attacking potential was thereby constrained during the first decisive phase without achieving the initial operational objective for Army Group Centre which was the city of Smolensk. In the beginning of July 1941 Army Group Centre had created two encirclements, one at Minsk and a larger one at Smolensk. The destruction of the Smolensk pocket would mean that a large part of the western group of Soviet Armies would be destroyed and securing the road for the eventual advance on Moscow. The slowly advancing German infantry soldiers were marching forward under relentless heat. However, the gap between the advancing Panzers and the slowly advancing infantry meant that insufficient troops were available to 'finish of' the pockets. Despite staggering Soviet losses, the Blitzkrieg momentum had run out of steam just beyond Smolensk. Without the infantry available to defend the Panzers, the Panzers themselves were required to fight defensive battles against the Russians, who continued fighting against all odds. The Panzers divisions were sustaining punishment far beyond that meted out by any foe thus far in the war. So far, by the 8th of July, the German general staff had calculated that it had destroyed 89 of 164 identified Russian divisions. But there were no further German formations of appreciable operational size available to continue the drive eastward until the Smolensk pocket was annihilated. Breathtaking the victories were, at the end of July the German army concluded that the vast battles it had fought meant that the Pyrrhic nature of this achievement was becoming apparent. Hitler's decision to start a new offensive in the south meant that most of the Panzers were transferred to the South, leaving Army Group Centre to play a marginal role. Meanwhile, the German soldier was growing more and more desperate. The vast space, the long marches, the heavy losses due to the stubborn Russian resistance meant that by now, most German soldiers were convinced that the campaign would not end shortly. Atrocities on both sides were commonplace. National Socialist propaganda had 'dehumanised' the enemy before the campaign had begun. The infamous commissar order meant that every captured commissar was separated from soldiers and executed. Maltreatment and shooting of Rusian PoWs was widespread. The logistic 'trip-wire' was the limit of the Ostheer's strategic logistical sustainability beyond which an offensive aimed at Moscow could not be achieved unless supported with a rail-based transport network. The lorry fleet, already decimated by the eve of operation Typhoon, was barely able to keep up with the fighting formations, but deliveries to the German troops were always too low. However, at the beginning of the campaign, no preparations were made to adjust the Russian railways to the standard European gauge. Once adjusted, the Russian railway tracks proved not fit for the heavier German locomotives and Russian coal could not burn effectively in the German steam engines. The Germans simply thought that the war would be won within 500km from the starting point of the invasion. On 26 September, Army Group Centre was to become the new Schwerpunkt for the final push to Moscow. The attack aimed again at an encirclement, with the closing east of Vyazma, 160km from Moscow. The offensive would begin with its main Panzers at half its strength, shortages in fuel, ammunition and spare parts. However, the average German soldier was full of confidence - this would be the final battle resulting in victory. Once more, vast number of Russian troops were encircled and destroyed. Nothing now lay anymore between the victorious German army and the fall of Moscow. General Georgi Zhukov was recalled from Leningrad and ordered to report to the capital. On October 8th, the first snow fell. The roads were covered in mud and the German soldier was becoming more and more concerned. Movement for the Panzers was impossible. It was not until November 12th that the Panzers were able to move again. By that time the ground had frozen and the roads could be traveled again. Winter had come. The final phase of Operation Typhoon was launched on the 16th of November. Snow and ice conditions changed the nature of fighting on the Eastern Front. Both sides were subjected to the same conditions but the Ostheer was disadvantaged by the unfamiliar environment. They were neither trained, equipped nor psychological prepared for winter operations. These were degraded to man-to-man frontal attacks, because flanking operations were denied by the harsh conditions. German casualties were high, especially felt at NCO level. The Luftwaffe support began to fall away because bad weather and the effects of the resupply crisis. The assumption was that, following a German victory, an occupation army of 56 divisions would remain in Russia for the winter. At the beginning of September it dawned upon the planners that there needed to be an increase of 50% in number of trains to clothe 750,000 men. Not until mid-December did it become apparent that the mass of units would not only stay in Russia, but would actually engaged in active operations. Economic production was unable to remedy the shortfall. An appeal was set in motion for the German civilian population to provide winter clothes and skis for the troops, only to become snarled up in sidings at Warsaw as greater importance was given to fuel and ammunition. Meanwhile, the railway logistic network ground to a frozen halt as a result of the weather and partisan attacks. The results were catastrophic. The Germans had to use white sheets from occupied Russian houses to camouflage themselves and started to chalk their helmets white. During clear evenings the advancing infantry could see the flashes from Flak and the searchlight beams above the city of Moscow. The German effort had reached crisis point. Panzergruppe 3 at Krassnaya Polyana was within 20km of the suburbs. The Germans still were convinced that the Soviet forces were on the verge of collapse. The contrary was the case. New armies from Ulan, Siberia and the border with Mongolia and China were being formed and assembled just behind the front. Russian intelligence was being informed that Japan was verging on an attack to the South, far away from Russian territory which freed Russian divisions from Siberia to be transferred to Moscow. In a frantic counter-offensive, the Germans were driven from the gates of Moscow. Given that this book's title is misleading, and that it is poorly edited (running a manuscript through a spell checker is not editing! ), it is a fascinating and illuminating read. This book is essentially the story of the German Army Group Centre's attack on Russia, from the 22 June 1941 to their withdrawal from Moscow in early 1942 - with a sideways glance at Army Group South's encirclement of the Russians around Kiev, and Army Group North's siege of Leningrad. Kershaw's style of storytelling - h Given that this book's title is misleading, and that it is poorly edited (running a manuscript through a spell checker is not editing! ), it is a fascinating and illuminating read. Kershaw's style of storytelling - he's not the (Ian) Kershaw of the Hitler biographies - is to rely heavily on letters, diaries, SS reports and unit histories. This is quite successful in that it gives the reader a sense of immediacy, and makes this large book (580 pages) a pageturner almost to the last. While most readers with an interest in World War II will know the history of Operation Barbarossa, Kershaw's book gives us the feeling of what it was like to be a German or Russian soldier caught up in the fighting. While the general history emphasises the enormous victories by the German army, what comes out through the quotes of letters and diaries in this book are the immediate enormous losses by the German Army Groups, even while they were scoring victory after victory. Kershaw makes the point that this first year of Barbarossa (indeed the first six months), wiped out the "old" core of officers and NCOs, who had fought through the earlier campaigns, and they were being replaced by cadres more steeped in National Socialist ideology. This loss of the "moral" core of the Army is noted by Kershaw. Even at losses of manpower running at a quarter of the rate of the Soviets, the German Army lost over half a million men in the enveloping battles before getting to the gates of Moscow, with a corresponding loss of equipment. The folly of the Germans believing that Russia would collapse in a matter of weeks came back to bite them, with equipment failing not just from the cold, but from being worn out, as it wasn't replaced after the earlier campaigns in France and the Balkans. The German's lack of strategic basis for the campaign also created problems, with a desire to destroy the army in the field meaning that Panzer units were being moved hither and yon to fight the Soviets where they were massed, rather than focussing on taking cities such as Moscow and Leningrad in the initial thrust. The planning was also hit hard when the OKH discovered they were not fighting the 200 divisions they expected, but 360. Operation Typhoon, Army Group Centre's thrust at Moscow, started too late in the year, and was almost doomed to fail before it began: the lack of logistical support before the attack due to the inability to move material across the primitive Russian road and rail network meant that the remaining front-line forces (20 - 35% smaller than at the beginning of Barbarossa) did not have enough fuel, ammunition, replacement tanks and motorised transport - not to mention the criminal lack of equipment to fight the penetrating cold of the Russian winter. The mood of the soldiers throughout the campaign seems to be one of weary forbearance - never getting enough sleep or food, many of them succumbed to disease and cold owing to lack of physical health, and even in victory there seems to be a lack of a feeling of triumph. If you are a student of World War II history, and the Russian campaign in particular, this book would be worth hunting out - it gave me a new perspective on the early German triumphs in that campaign. Nuostabi, viena geriausių skaitytų knygų apie karą! In simple terms, "War without garlands" should be mandatory read for anyone interested in WWII. It is to my knowledge one of few english books on Barbarossa that dispells any doubts about possibilities of German victory in 1941. 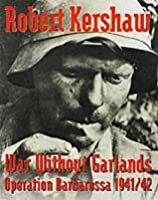 By relying solely on facts such as loss numbers, logistical ability of both sides and orders of battle at different stages of the German offensive, Robert Kershaw demolishes all specucaltions and fantasies about a possibility of any other outcome than the one that took p In simple terms, "War without garlands" should be mandatory read for anyone interested in WWII. 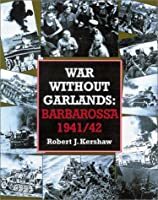 It is to my knowledge one of few english books on Barbarossa that dispells any doubts about possibilities of German victory in 1941. By relying solely on facts such as loss numbers, logistical ability of both sides and orders of battle at different stages of the German offensive, Robert Kershaw demolishes all specucaltions and fantasies about a possibility of any other outcome than the one that took place. Along the way, he also takes care of the usual myths about the reasons of German failure in 1941. It wasn't the weather, it wasn't the bad roads and it wasn't the delay caused by invasion of Greece and Yugoslavia. Kershaw shows slowly and methodically that German High Command completely misjudged strength of Red Army, underestimated the size of the task that Germany tried to tackle, didn't have a clear plan nor sufficient forces. Most of all, the Blitzkrieg doctrine failed in Soviet Union for variety of different reasons, but mainly because Red Army didn't crumble and fought every step of the way from the borders to suburbs of Moscow. A really great book. Kershaw (Robert, not Ian) puts the weight on the sufferings (and crimes) of the German soldier and he does so in a spectacular way. The text is sprinkled generously with firs-hand accounts from post-war interviews, letters, official histories, journals etc. While the strategic part is somewhat missed (this is not the focus of this book) I had to pause quite a few times and read quotes to my girlfriend (and yay, she listened). he only (minor) gripe is a weird insistence on rep A really great book. Kershaw (Robert, not Ian) puts the weight on the sufferings (and crimes) of the German soldier and he does so in a spectacular way. The text is sprinkled generously with firs-hand accounts from post-war interviews, letters, official histories, journals etc. While the strategic part is somewhat missed (this is not the focus of this book) I had to pause quite a few times and read quotes to my girlfriend (and yay, she listened). An incredible narrative that covers the period June 1941 - January 1942 from a predominantly German perspective. Explains clearly what led to the reverse and eventual defeat of Nazi Germany using a huge amount of personal testimonies, letters and accounts. Kershaw manages to clearly describe the events of this 6 month period over nearly 600 pages without becoming bogged down in details and political/economic mumbo jumbo. * Covers not only the military operations but also provides discussions ranging from the camps for Soviet prisoners to personal moral conflicts that the German and Soviet soldiers experience. * Plenty of direct quotes from the combatants that provide insights about the war, for example: before the invasion, a German officer is wondering whether he should bring more summer clothing and a sabre because he thought they will only be passing through USSR towards British Asia. * Needs more editing, plenty of redundant and repeated information (e.g. the information about 50% of Army Group centre is required to destroy the Minsk pocket is repeated several times). Near the end the problem gets a lot worse. I have read extensively about the Eastern Front Campaigns of WWII. I enjoyed this book mainly because Mr. Kershaw focused on the war from a more personal level not a high level history of which units or armies did this, move here, etc. One can read this book if you don't know much about the fighting on the Eastern front but having already knowledge of this part of WWII gives one an advantage to enjoy the book more. It was very easy reading and not dry and slow like some history books. Absolutely awesome, highly recommended. Brutal account of "war without garlands." this book compiles many first hand accounts of war on the eastern front in the initial years. There has been a large amount of scholarship in the last 15 years that I would call revisionist in that it gets past the postwar simplistic view of the eastern front and gets into the reality of the hell it was and the strategic suicide it represented for Germany. Read the whole thing. This book tells the story of the Barbarossa invasion from the German solder's point of view. It makes extensive use of diaries. I actually felt some sympathy for these soldiers even though I knew their purpose was evil. Yet their suffering is beyond the imagination. It is a good book to read in order to get an understanding of what it must have been like for the common German soldier in this incredible campaign. A must read to understand the horrible account on the inhumanity of the Eastern Front. Fascinating!! Wonderfully written book with a million details. A human disaster of epic proportions told by an excellent writer! Kershaw has assembled rich and useful material, assembled it to form solid arguments, and written it in a lively style! Well worth reading. The book presents a convincing argument as to why the German invasion of the Soviet Union was doomed from the start. If you want to understand the consequences of a faulty world view and how it affects polito-military judgement, read this book. If you want to understand the 2nd World War, read this. A book that does what it sets out to do. Detailed without being obsessive, informative without being pedantic. the book goes of the campaign trail to personal feelings and sufferings. focus on the leadership is lacking. overall gives a relatively accurate account of the campaign colored by personal details. A remarkable and fascinating insight into the personal reactions of soldiers to the 1941 German invasion of Russia. He served numerous regimental appointments until selected to command the 10th Battalion The Parachute Regiment (10 PARA). He attended the German Staff College (Fuhrungsakademie) spending a further two years with the Bundeswehr as an infantry, airborne and arctic warfare instructor. He speaks flu Born in 1950 and a graduate of Reading University, Robert Kershaw joined the Parachute Regiment in 1973.